On the surface, China's March data was surprisingly strong, largely as a result of strong policy easing and in light of China's massive 40% surge in Total Social Financing, even adjusting for the Chinese New Year factor, the data indicated a recovery in economic momentum, if only for the time being. As DB's Jim Reid recapped this morning, starting with China’s Q1 GDP, the print came in one tenth above expectations at 6.4% yoy while all of the March activity indicators surprised on the upside with industrial production surging at +8.5% yoy (vs. +5.9% yoy expected) – the highest since July 2014. Retail sales printed at +8.7% yoy (vs. +8.4% yoy expected), YTD fixed assets ex rural came in line with consensus at +6.3% yoy and the jobless rate fell one tenth to 5.2%. That said, as SocGen's Wei Yao pointed out this morning, the expenditure breakdown was not as positive. According to the NBS, net exports were the only improving segment, while both consumption and investment (including inventories) weakened notably in 1Q. Furthermore, the pick-up in net exports had more to do with weak imports than better exports. Consistently, overall fixed asset investment (FAI) growth moderated from 7.2% in 4Q to 6.3% in 1Q, although in real terms. By sector, infrastructure investment growth slowed from 6.0% to 4.2%, and manufacturing investment growth continued to moderate, from 11.5% to 4.6%. However, property investment picked up again from 8.4% to 11.8%. First, overall housing activities did stage a come-back in March as property sales recovered from -4% in the first two months of 2019 to 2%, lifting the quarterly growth from -2% in 4Q to 0.9% in 1Q. Yet while growth in new starts rebounded quite sharply in March to 18% from 6%, this was not enough to stop the quarterly deceleration from 19% in 4Q to 12%. But the big question is regarding the outlook. On the positive front, housing policy seems to be easing more notably from less stringent credit conditions for developers to relaxation in the 2nd-tier cities’ Hukou policy. 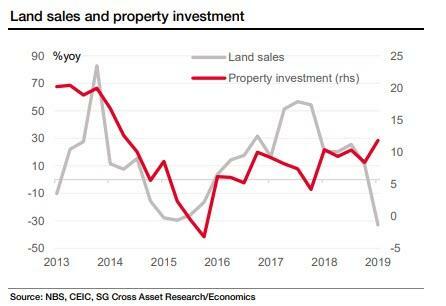 However, ominously, land sales revenue growth collapsed to -33% in 1Q from 11.8% in 4Q18. This, as SocGen notes, "clearly does not augur well for property investment in the coming quarters." 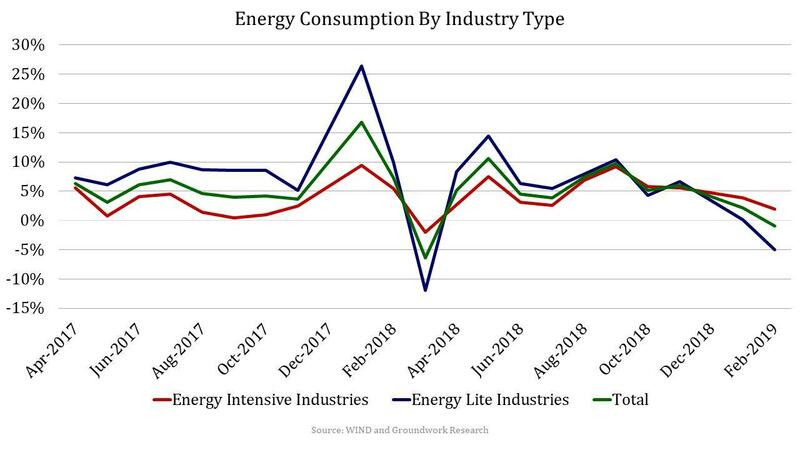 Last, but not least, was the latest energy consumption data, which while not highlighted in yesterday's report, was certainly a concern because in a quarter in which industrial production reportedly soared higher, we also saw the first contraction in total energy consumption, which shrank by 1%. That this took place when China's economy allegedly grew by 6.4% certainly puts the veracity of China's data under the microscope yet again. So whether China's data was real or not, and there is enough historical precedent to lean toward the latter, the question is what this means for Beijing's future policy. Here, as SocGen notes, "together with a stronger fiscal impulse and more positive economic data - whether they last or not, it is only logical for the PBoC to pause headline easing for now." Additionally, the sharp upward trend in credit growth also does suggests that the economy may not need as much liquidity easing in the future, which in turn will likely cause the rebound in China's credit impulse to fizzle in the coming months. Echoing this take, Deutsche Bank's Jim Reid wrote that "the downside to the numbers will be a more hawkish PBOC" and indeed, on Wednsday the PBOC injected much less liquidity into the market than was expected. In short: while China has clearly benefited from the trillions in new credit injected into the system, the question is how long will this impulse last, how sustainable is the resultant reflationary ripple, and what happens when the "sugar high" from China's stimulus once again fizzles, especially if a US-China trade deal is still to be finalized.